Today we are going to share some of the best handbags WordPress themes for bags and handbags, purse making or bag producing companies, handbag stores and boutiques to share their luxury or unique products online. Handbags are not just necessary accessories of women wardrobes. They are means of self expression, style and social status as well. Therefore almost every single woman or a girl treats choosing a handbag as a sacred duty and puts lots of efforts on it. So what’s the shortest way to get access to unlimited handbags offers and even the possibility to purchase them? Of course, the global networking platform with its websites and blogs catering to handbags and bags, belts, bracelets, earrings and other accessories. In this article, we’ll shed light on some of the top rated handbags WordPress themes which are ready made to outshine your competition online and accentuate the style and unique fashion your handbags share. Whether you are going to run an entertaining blog relating to the latest handbag fashion trends, a website presenting luxury products, among them also handbags, or want to sell them online, our templates are for you. As from a more structural viewpoint, each of the handbags WordPress themes discussed below is based on a clear coding and customizable framework for you to intervene whenever needed. Moreover, there are also lots of coding and features done by the professionals which you’ll never see or deal with, however, will greatly benefit from. It means that you don’t need to be a superhero in WordPress platform to manage your site quickly or extend its functionality just the way you need. Always updated and self secured, glamorous and creative, Luxury Watch is one of the lovely handbags WordPress themes for sharing your luxury products and items, including bags and handbags, paper bags, wallets and purses, belts, and even cars and other products. The theme’s eye catchy face has a lot to do in contributing to your client’s overall impression whenever they land on your site. Additionally, they are supported by clutter free navigation and scrolling controls, as well as the right typography and color combinations which are chosen by you. Mobile friendly and responsive, Luxury Watch is also widget friendly with pages, footer and header, and offers blog area for keeping your audience hungry for daily news and updates. When it comes to buying something, people never step away from thousands of online offers and don’t save their time on virtually visiting all possible stores and shops. In this relation, Shopzee can effortlessly help you in running your handbags store or boutique online and accept orders. It’s a whole new and comprehensive commercial solution for any business, especially, when WooCommerce shopping platform and cart are added to it for better content categorization and publication. PayPal, Credit Card and other payment methods can be easily exercised within the theme to accept payments as well. As for other effectual features of Shopzee, it shares completely SEO coding for boosted traffic, simple and admin optimized admin dashboard to add primary and secondary content, as well as to make changes to the interface and functionality. 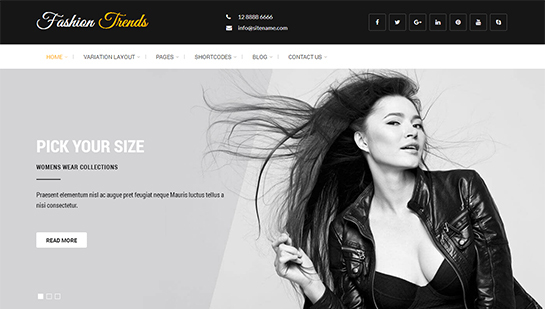 Fashion Trends as one of the latest handbags WordPress themes can be a true inspiration for every handbag or fashion related business or company, store or industry. Marketing your bags and handbags, advertising your fashion blog or site takes strategy and certain working mechanisms. Fashion Trends comes as a complex of the most demanded strategies and functioning tips for you to achieve all your personal or business goals. The theme’s structure is well calibrated for you to categorize your content and showcase it through the given areas and parts. Among them are HD readiness both for desktop and mobile versions, Customizer to organize the management of the theme from backend and preview each of the changes, flat style design trends and SEO optimization. SKT Landing Page is the next ecommerce compliant and shopping ready platform to turn your online efforts into tangible incomes. SKT Landing Page knows the right way to combine elegant styling with persistent character giving rise to responsiveness and cross mobile compatibility. Establish a professional level relationship both with suppliers and producers on the one hand, and clients and consumers on the other hand while inserting all your contact details and other useful information in footer and header, as well as contact us parts. Clean and minimal design styling is widely exercised in relation to SKT Landing to make your offers and products accurately deployed and easy to notice. Girlie is one of the women and girl centric handbags WordPress themes for female entrepreneurs and business ladies, enthusiastic fashion experts and bloggers, boutique owners and fashion center owners. Every single aspect and part of this lively and nice looking template has been coded and developed taking into account the preferences of the feminine world and its representatives. As such, it comes bundled with unique design with animated sections, Google approved mobile coding, gallery area for the pictorial manifestation of your handbags and other accessories, etc. Based on HTML5 mixed up with CSS3, Girlie hosts responsive slider at the top of the homepage, as well as shortcodes preenabled for accordions, testimonials and much more. SKT Parallax Me Pro is a parallax and modern looking template ready to put all your endeavors into practice and generate a battle ready website for you. In order to start your website or establish and online store to sell your handbags, you don’t need to be an expert in technology or WordPress. Even the shallow understanding of the given platform is enough for you to intuitively manage and customize it as per your demands. From responsive and mobile optimized layout to testimonials area for positive feedbacks, Po file inclusion for translation related arrangements and preloaded shortcodes at your disposal, SKT Parallax Me Pro shares it all. 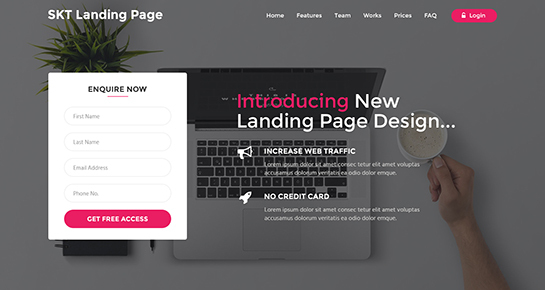 This entry was posted in wordpress themes on March 22, 2019 by SKT Posts Themes.